To place your order online, just give us the exact measurements of your digital piano as shown in the diagrams, and type them in the space provided below. 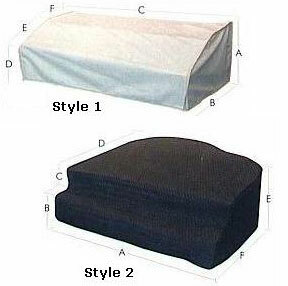 For Style 2 pianos a paper template will be required - instructions will be emailed. or call us toll-free at 1-800-791-7144 to place your order. A very high quality piano cover that was custom made and fits perfectly. Love the black macintosh. We are very pleased, thanks for the great customer service and fast turn around time! I was more than pleased with the quality and fit of my new cover!!! It fits perfect and is a really quality fabric! Thank you!!! Nice fit. Good looking, too.